It has been awesome weather so far in January! Days can be windy and cool, but overall it has been beautiful on the water. Water temps are in the mid 60’s lately and that usually means deeper water for better results. As the day warms up, you can fish shallower water when the fish move up onto the grass flats. Expect those weekly cold fronts to move through the Treasure Coast and keep the water cooler this month. Winter is a short time for us and spring will be here soon. The Treasure Coast Casters had their monthly tournament and the kids all had a great time. You can go to their Facebook page for the results of the tournament. 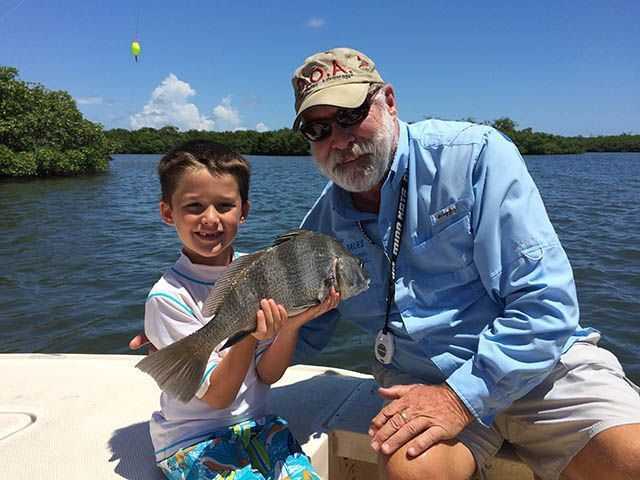 If you have kids or grandkids in school who love to fish….check out the Treasure Coast Casters! The kids have a wonderful time and learn boating and fishing and have a good chance at winning some super prizes and trophies. You can call Cammie Ward at 772-201-5773. I had Nick and Bruce this month. The boys caught lots of fish, but they were all too small the check in. Lots of black drum and snapper along with a nice trigger fish and red grouper to add to the catch. Everyone had a fun day! Look for trout to be on the grass flats as the water warms up in three to five feet of water. Our redfish have been hanging under docks along with drum, sheepshead and snapper. Channel edges and bridges have been good for snapper, sheepshead and drum. Mackerel, jacks and ladyfish have been coming in with the tides. Offshore has been good for sailfish when you can get out. Bottom fishing has also been good when the seas allow. It’s winter….so you have to work with the weather for best results!